Last November, my team played in a World Curling Tour event. Our team couldn’t be considered “competitive”—we play about one such event a year, whereas the good ones are looking at about a dozen weeks a year. We know what we’re doing; we’re just out of shape. Still, we finished 0-3 in our pool and out of championship contention. That Sunday morning, we played in the consolation bracket with the five other losers with no real ambitions. We just wanted to play better than our record indicated. As fortune had it, we ran the table to claim the entire consolation championship and a little bit of pocket money. Just keep playing, and you never know what will happen. Curling is a lifetime journey. John Shuster and Team USA had no choice but to keep playing after they began 2-4 in round-robin play in South Korea, though it felt like yet another Olympics of choking, crashing and burning. But the next morning, with nothing else to lose, they took the ice against Canada and knocked them off 9-7. 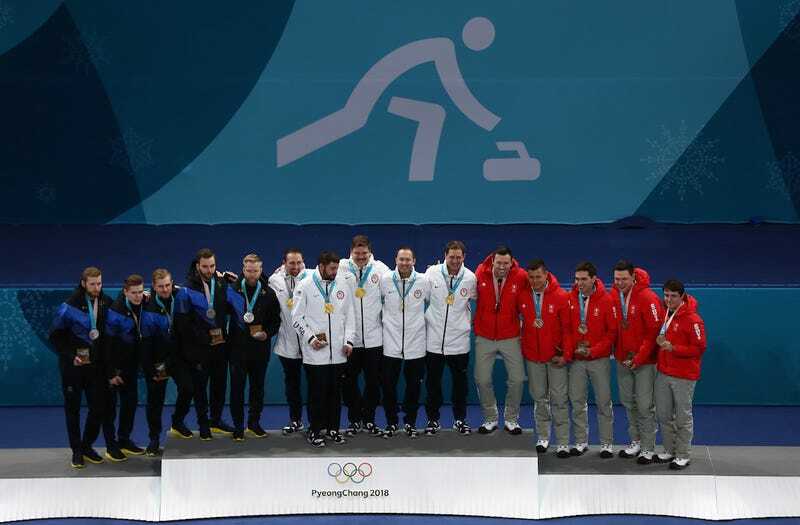 Shuster was overcome with tears in that postgame interview, invoking inspiration from speed skater Dan Jansen, whose Olympic hexes kept him from medaling until his final race in his fourth Games. That itself felt inspirational enough, because this sport is all about the moments that occur in a journey. That’s the kind of stuff you say when you don’t win it all, right? The real draw to the button is the friends you make along the way. Of course, it didn’t end there. Shuster’s squad completely forgot how to lose, and now Aaron Rodgers and Matt Hamilton are basically besties. 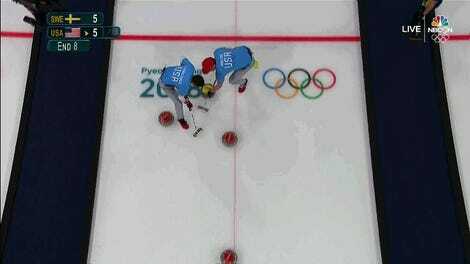 That unforgettable gold-medal match will be basically every American curler’s moon landing. I’d estimate that well over half the 20,000-plus curlers in our country watched that game live, and if you heard a loud noise on Feb. 24 at 4:00 a.m. ET, that was us, and we’re sorry. With all that said, at the end of the Olympics, I still can’t stop thinking about Rachel Homan. Homan, more than anyone else, was bred to be a curling champion. She started winning 16-and-under championships when she was 13. She won multiple Canadian championships and went undefeated in 2017 Worlds. She torched her countrywomen to wear the maple leaf in Pyeongchang. This past week was supposed to be the coronation of the juggernaut that is the Canadian women’s curling team, crossing over into niche sports star to mainstream stars. That’s how the sport goes—sometimes you just have an off-week. Canada started off 0-3, losing to gold and silver medalists Sweden and South Korea, but then lost Denmark amid a burned rock controversy. Their 4-5 finish solidified them as the first Canadians to fail to reach the playoffs in a modern Olympic tournament. The last Canadian women to do that in a world championship was 1999. It was heartbreaking, but the sport is cruel like that. Homan is 28. Her teammates Emma Miskew (29), Joanne Courtney (28), and Lisa Weagle (32) aren’t leaving the scene, nor should they. If Jennifer Jones can win a gold medal at 40, then Homan’s gals have at least two or three more swings to rewrite that story. As for Kevin Koe, the 43-year-old Northwest Territories native finally built a team able to push through the deep Canadian field into the Olympics, only to hit a three-game skid of their own. Koe’s squad still reached the Olympic semifinals but left empty-handed when they dropped the bronze medal game to Switzerland. It left Curling Canada asking so many questions about what went wrong, coupled with the more latent challenge of getting younger players into curling. The short, unsatisfying answer is: They just didn’t execute. The longer answer is: Canada might start handpicking their teams, which would be tragic ratings-wise and won’t change the fact that the rest of the world has caught up. South Korea became Asia’s first team to reach the gold-medal game as Eun-jung Kim and her “Garlic Girls” won silver. Japan and Satsuki Fujisawa’s “Death By Sunshine” team won its country’s first medal, a bronze. Italy … well, Italy made the Olympics (and can say they beat the gold-medal team, even putting up a five-spot of their own). Every Olympic sport is like this, but what mainstream sports fans see every four years is basically reading the book jacket of the story. A lot of them didn’t see Homan blowtorching the field at the 2017 worlds, or Team Koe doing likewise in 2016. They probably didn’t watch Niklas Edin and his top-ranked Swedish team exact terror on the World Curling Tour week after week, for four years, further amplifying how great this upset was. Even Edin’s journey has been treacherous. Yes, he has medaled in two Olympics, but countless transatlantic flights and multiple back surgeries were enough to know that the 32-year-old skip knew that the gold medal was not to be for him, so right before shaking hands to concede he threw his final stone with a bit of flair—the “spin-o-rama,” Jeff Stoughton’s signature showmanship move, which Edin has done before in out-of-reach games. If his body holds up, he might be back. The journey for all of these teams continues. Some of them will disband (which several teams have announced already, not uncommon as a new Olympic cycle begins). Team Shuster will sleep for approximately six hours before heading to Fargo to defend their national title, then presumably win the title and play in next month’s world championships in Las Vegas—all in between publicity appearances, of course. (Update: Shuster will be skipping the nationals but play in the Elite 10 next month.) Meanwhile, Teams Homan and Koe have a couple of Grand Slam events left this year, then they’ll figure out their future. Team Homan probably stays together, though Team Koe’s fate is up in the air. They got so far, but they can’t give up now. Imagine what would have happened if Shuster had the first, or second, time around.